Over the past few weeks, a few articles have been written about the Swarthmore Organization of Low-Income Students (SOLIS), a new student group for low-income and first-generation students. I had been waiting for this type of student organization to start at Swarthmore. In reading articles about different school initiatives for low-income students, Swarthmore’s presence had been nonexistent. Economically, Swarthmore isn’t the most diverse. The New York Times’ college accessibility rankings recently placed Swarthmore in the middle of its list. Among its 1,500 students, 15% receive Federal Pell Grants, which mostly go to students whose families make below $60,000. The rankings were based on the percentage of freshman in the three prior academic years who received Federal Pell Grants and the average net price in the 2012-2013 school year for students with household incomes of $30,000 to $48,000 a year. This article focuses on the often confusing definition of “first-generation.” While some define it as a student with parents that never completed college, others say it’s a student with parents that never attended college. I know some people want a set definition, but I think there should be varying levels of what first-generation means. Not all students that exhibit typical first-generation characteristics will fit into an ideal definition. Chronicle locked the article to subscribers, but thought it was worth sharing. I was able to read it on my mobile device. Another article from my alma mater! 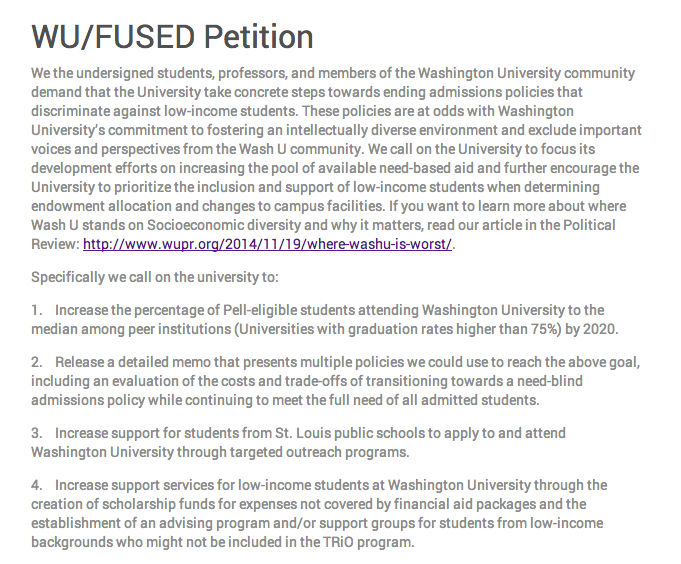 The editorial board of the school paper is indicating that the University’s new financial aid initiative doesn’t mean inclusivity for current low-income students. They detail changes that could be made, some my group has been bringing up for years. I’d like to think my group had something to do with the momentum! Macalester College was recently highlighted in a news article for their programs for first-generation students, specifically for their Bonner Community Scholars program, a four-year program for Macalester low-income students. With 12 scholars in each class, the program provides a pre-freshmen retreat and programming throughout four years of college. This isn’t the first article I have seen about first-generation students at Macalester. With first-generation students making up 11% of the student population, they are a growing segment on campus. In April, a piece was written about the life journey of Francesca Zepeda, a first-generation student at Macalester. She discusses how she bridges the gap between her background and privileged school-life. On Wednesday, the University of Chicago announced some major initiatives to increase college access and support for low-income students throughout their academic careers. Replacement of student loans with grants in all need-based financial aid packages: This is a big move to reduce college debt, which means the University is finally catching up to peer institutions in terms of sound financial aid policies. Though student activists will never receive credit for this change, the Southside Solidarity Network had been campaigning for a no-loan policy for the past few years. Elimination of the CSS Financial Aid Profile requirement: The CSS Profile is the worst invention to befall college students, so no one is sad to see this overly complicated application go. More than 100 free, nationwide information sessions on college application and the financial aid process: These sessions have the potential to make a big impact on the students applying to the College. The simplification of the financial aid process is a step in the right direction. Increasing access isn’t as simple as holding more sessions, though. The University has to be intentional about where they hold these sessions, in addition to their outreach, to ensure low-income students take advantage of these opportunities. In addition to showing a commitment to increasing college access, the University also announced changes to improve the quality of life for students already in the College.